1995 SPIDER-MAN FLEER ULTRA SERIES II 2 MASTERPIECES Complete 9 Card Set 1 -9. THIS IS A GREAT INSERT SET OF CARDS ALL IN MINT TO NEAR MINT CONDITION. THIS IS A GREAT DEAL FOR ANY FAN! Cards are NM and will make a great addition to your collection. The artwork and shine just on the tin itself is just superb. These are from 2013 and are already highly collectable. Putting together a complete set of 1995 Marvel Masterpieces CANVAS Chase cards is a very difficult and expensive task because of their scarcity and popularity. 1995 MARVEL MASTERPIECES. Spiderman 3 - Kraft Handi-Snacks Promo Cards. 2006 Set of 3 Cards. 9 Card "Rogues Gallery" Set R1-R9. 9 Card "Allies In Action" Set A1-A9. 3 Chase Sets - 27 Cards. Spider-Man Archives. Rittenhouse Archives 2009. All 27 cards pictured. Ash Trading Cards. 1995 SPIDER-MAN FLEER ULTRA SERIES II 2 GOLDEN WEB Complete 9 Card Set 1 -9. 1996 SPIDER-MAN PREMIUM '96 ETERNAL EVIL FLEER 100 Card Set. 1996 MARVEL MASTERPIECES NM/MT SET (100) - RARE !! 1996 Marvel Masterpieces. These gorgeous 100 cards feature the fantastic artwork of two of Marvel's best artists -Julie Bell and her husband,Boris Vallejo. This set is considered the "Holy Grail" of Marvel Cards by most collectors. TH ANNIVERSARY PRISM CHASE SET P7-P12. SPIDER-MAN 2 1992 30. SPIDER-MAN VS VENOM H-IV 3D INSERT HOLOGRAM (SLIGHT MIX TINT). BOTH ERRORS CAN BE CLEARLY SEEN IN THE 2 CLOSE-UP PICTURES PROVIDED. BOTH ERRORS CAN'T BE FELT, AS THEY ARE WITHIN THE IMAGE AND. UP FOR SALE IS A VERY RARE COMPLETE MASTER SET OF "MARVEL UNIVERSE IV" TRADING CARDS, RARE PROMO CARDS AND EXTRA RED FOIL CARDS. 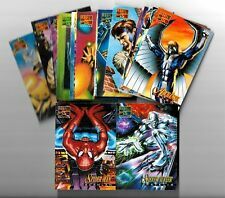 1996 SPIDER-MAN ETERNAL EVIL FLEER ULTRA CANVAS Complete 6 Card Set 1 -6. MARVEL UNIVERSE 2011 (Rittenhouse Archives, 2011) »Complete 90-Card Base Set Wrapper« One of the best Marvel trading card sets Rittenhouse Archives has produced! This awesome 90-card set focuses on 10 of the greatest crossover events in Marvel history with 10 different, 9-card puzzle murals, 1 for each crossover event. Includes 1 foil wrapper »NOTE: The scans in this listing represent samples from this set, NOT the entire card set **FREE shipping in the USA** NM/MINT condition: --**SEE SCANS BELOW** »NOTE: Other than the defects mentioned above--if any--any blemishes, scratches, dust or other visible defects are on the top-loader or plastic sleeve ONLY, not on the item shown »Foil, chromium, embossed and other enhanced cards can be difficult to scan. 2011 Avengers Kree Skrull War. It takes one minute to fill out the form and will ensure 100% accuracy for your order. All information is secure and will not be used for any other purpose besides processing your order. Spiderman 3 - Ritz Bits Promo Cards SET. 2006 Marvel Kraft Foods Spider-Man. In 1998 Fleer/Skybox produced the Marvel Creators Collection (MCC98) card issue. SKETCHBOARD SET - MIXED COLORS. 1998 Marvel Creators Collection. Each color had 24 different sketches of popular Marvel characters. In 1998 Fleer/Skybox produced the Marvel Creators Collection (MCC98) card issue. SKETCHBOARD SET - YELLOW. 1998 Marvel Creators Collection. Each color had 24 different sketches of popular Marvel characters. In 1998 Fleer/Skybox produced the Marvel Creators Collection (MCC98) card issue. SKETCHBOARD SET - BLUE. 1998 Marvel Creators Collection. Each color had 24 different sketches of popular Marvel characters. 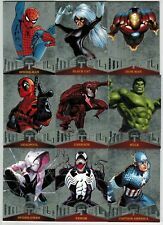 2017 FLEER ULTRA SPIDER MAN MARVEL 1995 MILESTONES Complete 12 Card Set #M-1 to M-12. Produced by FLEER in 1994. Set consists of:150 CARDS. 1994 SPIDER-MAN FLEER SERIES I 1 GOLD WEB FOIL JUMBO Complete 6 Card Set 1 -6. In 1998 Fleer/Skybox produced the Marvel Creators Collection (MCC98) card issue. SKETCHBOARD SET - GRAY. 1998 Marvel Creators Collection. Each color had 24 different sketches of popular Marvel characters. MARVEL UIVERSE 2011 (Rittenhouse Archives, 2011) »Complete 9-Card "Artist Draft" Insert Set Stunning 9-card chase set featuring both color and black & white versions of classic modern Marvel comic book covers! Includes cards #AD1-AD9 All cards in this set appear in the image scans **FREE shipping in the USA** NM-MINT condition: --**SEE SCANS ABOVE** »NOTE: Other than the defects mentioned above--if any--any blemishes, scratches, dust or other visible defects are on the top-loader or plastic sleeve ONLY, not on the item shown »Foil, chromium, embossed and other enhanced cards can be difficult to scan. The card (s) you receive may look slightly different than in the image scans **Please ask any and all questions BEFORE bidding or buying. Spider Man 3 by Rittenhouse in 2007. 79 card base set. All cards are nm/mint condition. The UK and almost all of the EU plus Australia, New Zealand & Canada do participate. Interior cards are in mint condition. This is a complete 7 card set of MAXIMUM CARNAGE promo cards. The first six cards when placed together as shown - create a picture of CARNAGE on the backs. A great, rare, set for the Marvel/Carnage card collection! 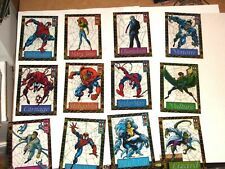 1996 Spider-Man PREMIUM INSERT CANVAS ETERNAL EVIL 6 Card Set! VENOM 2 SIGNED! THIS IS THE beautiful 1996 Spider-Man PREMIUM INSERT CANVAS ETERNAL EVIL 6 Card Set! VENOM CARNAGE! THIS CHASE CARD SET IS ONE OF THE BEST AND HARDEST FIND OUT THERE OF THE MARVEL CHASE SETS. THIS CHASE CARD SET FEATURES SPIDER-MAN, VENOM, AND CARNAGE! 2004 Marvel Upper Deck. Non Numbered Promo Cards. 1984 FTCC MARVEL SUPERHEROES Set of 60 cards - RARE! 1984 MARVEL SUPERHEROES. MARVEL SUPERHEROES. These cards feature First Issue Comic Covers for the Marvel Superheroes. The box and cards are in NM/MT condition. This is a RARE Marvel card set and would be a great addition to any classic Marvel Card collection!